As Herts Sports Partnership focuses its work in to two strands; Sport for Social Change and Physical Activity for Wellbeing; there has never been a greater need for a fit for purpose workforce to support our work in areas. Our extensive engagement with sports coaches, instructors, volunteers and educators has given us valuable insight in to the skills gaps and the training requirements across the sector. Herts Sports Partnership recognises the value in providing opportunities for people to work in the areas which they know best. Our new education and employment programme aims to identify and work with hard-to-reach young people from some of Hertfordshire’s most deprived communities. We want to support them to engage in education and employment opportunities so that they can use sport as a positive vehicle to a more prosperous future, while enriching the sport sector with a diverse and skilled workforce. Volunteers are happier: they often feel a sense of pride and say that their life has a sense of purpose. They meet new people: Volunteering in sport is a great way to make new friends and connections. It’s a great way to develop new skills: Volunteering can help to improve current skills or develop new ones. These are benefits which are all often not experienced by many hard-to-reach young people. Herts Sports Partnership’s ambition is to use sport volunteering opportunities for young people undertaking reparation orders, or who need to do community service as part of their court order, or by order of the Youth Panel. Through this, they have the potential to develop a lifelong healthy habit of volunteering, participating or working within the sport sector. A traineeship is a flexible education and training programme with work experience that unlocks the great potential of young people. It prepares them for their future career by helping them to become ‘work ready’. 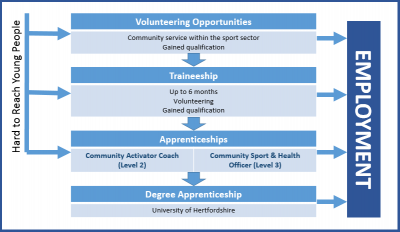 Herts Sports Partnership are developing a traineeship programme which will provide opportunities within the sport sector to help young people who don’t yet have the skills or experience needed to get an apprenticeship or job. These opportunities will involve achieving or working towards a relevant qualification to ensure that the young person is appropriately upskilled for their next step. Young people will be deployed within community Sport and Leisure placements where they will have real-world application of the classroom-based theory they learn along the way. They will be working towards the Community Activator Coach (Level 2) or Community Sport & Health Officer (Level 3) standards. The standards have been written by forward thinking employers from across the sector, and embody the skills and knowledge that are needed now and in the future. Learning with StreetGames will ensure the apprentice specialises in working in low-income areas; a key priority for Herts Sports Partnership. By providing these young people with the skills, knowledge and opportunities, we hope to see some of them enrol at the University of Hertfordshire as Degree Apprentices, where they can continue to develop and learn within the sector.